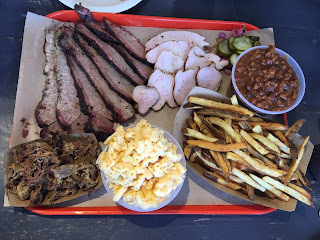 A friend let me know about this relative newcomer to the Calgary BBQ scene early in February and we quickly made plans for a visit. Before making it there though, I started following them on social media and enjoyed seeing the joint's namesake, Paddy, document his travels to some of the Texas barbecue spots I have been fortunate enough to visit. It was a nice February afternoon when Andrew, and I visited Paddy's along with our youngest daughters and Andrew's friend Scott who was visiting from Hong Kong. We had worked up an appetite playing laser tag and we were ready to eat! 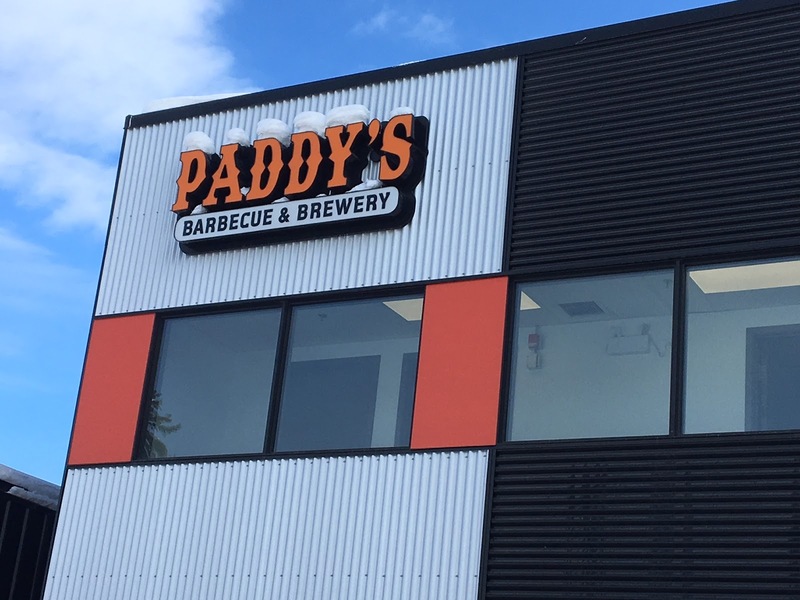 Paddy's is located just off Macleod Trail on the south side of downtown Calgary, in a bit of an industrial/commercial area. Parking can be a bit tight, but once all the piles of snow are melted that should free up a few spots. The interior is clean, modern and welcoming. 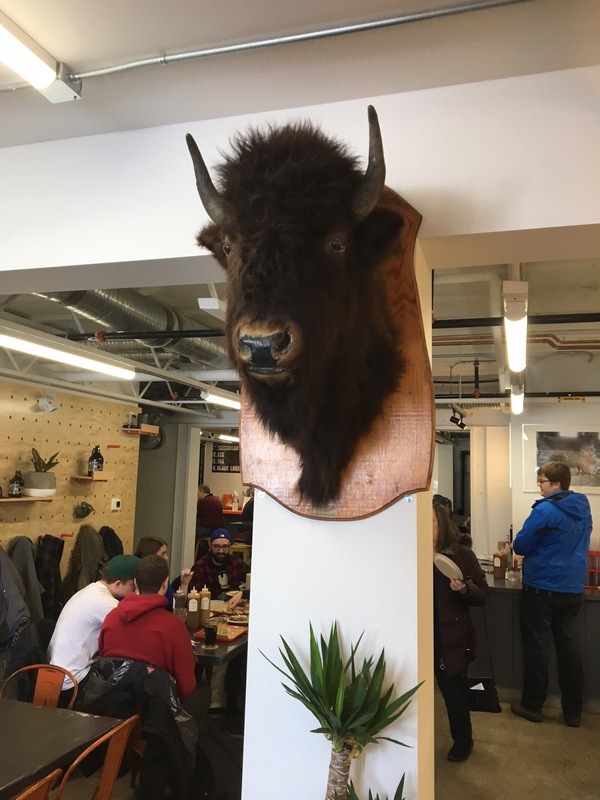 They have clothing and hats for sale that decorate the walls, along with an awesome bison (or is that buffalo?) head mounted near the entrance. Just inside the entrance is the ordering counter where you get a numbered sign to take to your table. The back of the restaurant houses their beer brewing area and a bar where you order your drinks. They brew a number of their own beers here and also feature guest brews on tap. They also feature a house made root beer for the younger crowd or those not wanting beer. Unfortunately, besides a self serve water jug, the root beer is the only non-alcoholic option. If you like root beer, it is worth a try for sure though! We determined that the Family Feast was going to fit the bill for our group and ordered it up. The feast comes with 1 lb of brisket, 1 lb of turkey and 1/2 lb of pulled pork along with 3 sides. We opted for the baked beans, cheesy mac and fries. They serve white bread, pickles and pickled red onion on the side. The 3 adults ordered up a flight of 8 mini sizes glasses of an assortment of beers. A few minutes later our food arrived and toasted our laser tag accomplishments and dug in! The meat comes out the way it should in my opinion - that is without sauce. They have a couple of sauce options in bottles on the tables. I found the brisket tasty with a nice peppery bark, but it was a little dry and tough and didn't pass the tear apart test. The pulled pork was excellent. It was nice and moist with a slightly tangy flavour. My favourite meat on this day was the smoked turkey. It was incredibly moist and tender with just the perfect kiss of smoke. I haven't had a lot of smoked turkey at barbecue restaurants, but this was easily the best. For the sides, I enjoyed the baked beans and the cheesy mac. The fries were excellent and I liked the pickles and pickled onions. I found myself back at Paddy's a couple of weeks later, this time with my wife and youngest daughter. It was about 6:00 on a Saturday evening and we decided to stop in to see if they were open. Not only were they open, but the place was packed! A great sign! We went for the 1/2 family feast this time around which featured brisket, ribs and a 1/4 smoked chicken with two sides. The brisket was considerably better this time around. It had the same excellent flavour and bark as on my previous visit, but it was far more tender. I really enjoyed the ribs. Like the brisket, they had great flavour and seasoning and they were cooked right to my liking. For me, that means not quite falling off the bone, but when you bite into them and pull with your teeth, the meat comes off clean. I had the chance to meet Paddy on this visit and he mentioned that they were tweaking their rib recipe. I'd say they are on the right track! The chicken was excellent and was easily my wife's favourite protein. Much like the turkey on my earlier trip, it was moist and juicy and had just the perfect amount of smoky flavour. Our sides were the beans and the coleslaw. The beans were great once again and I liked the coleslaw as well. The dressing was a little bit on the vinegary side. I generally enjoy more of a creamy slaw dressing, but this was nice and refreshing. The vinegar is good for balancing off the heavy meats as well. 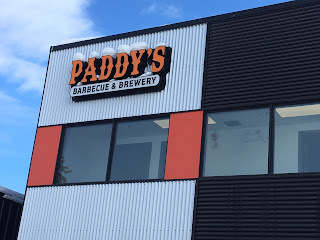 Paddy's is an exciting addition to the growing Calgary barbecue scene and it is great to see a joint doing it right. Get over there and support Paddy's, you won't be disappointed.